Hi and welcome to another month in the lives of the happy travelers. I must say I get some sort of perverted joy from sitting in front of the computer each month reflecting on what we have done and seen in the last month. For myself the reward for my efforts are the emails we receive from both friends and total strangers who follow our adventures, as well as having a permanent journal that I will be able to dribble over in the nursing home in 30 years time. One of our regular readers and friend is Mick from Bundaberg. He has been following our journey for a number of years and has become our unofficial proof reader. Let me explain. It goes like this. I write, my long suffering wife Chris then spends hours correcting my shocking spelling and my even worse 'grammer'. (Need I say more?? Ed.) As a teacher she prides herself on correcting each month's literary masterpiece with enormous accuracy. Well, most of the time. Now in comes Mick. He must scour each month with a micoscope and does occasionally pick up a slight spelling oversight. He then sends us an email explaining our error. This is the one from last month. As usual the website is showing much improvement in the spelling stakes, however I think that your forthcoming asian jaunt may be causing you to rush and not spell-check thoroughly. "We have added our own catorgory, menopausal"
We love Mick's wit, we look forward to his emails and we treasure his friendship. It is almost worth making a mistake just to get one of his witty notes sent to us. Keep up the good work big fella, and thanks for keeping us honest. In comparison to our usual life, March was down right boring. We did very little, and loved it. Our only outing for the month was a quick weekend escape to Kununurra. We stayed in the hospital house that was very comfortable and right in the middle of town. Most of Saturday was spent going to the library and then shopping. In fact $1450.00 worth of mainly grocery shopping. Lucky this place has a big pantry. While that sounds like a hell of a lot of money we need to take two things into account (as explained to me by Chris when I had a minor meltdown), the first is this will have to last us 4 - 6 weeks, Kununurra is a little more expensive, we needed a lot of toilettries and cleaning stuff, and 'shut up or you can do it yourself!' (Isn't that 4 things!??!! ) The next challenge was how to get all the meat in the car fridge and the other food somewhere in the car. And they thought putting a man on the moon was a challenge! 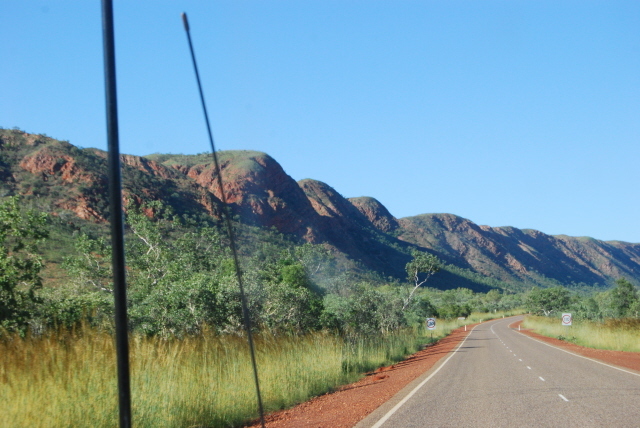 Anyway we did get it all in and then on Sunday we planned to explore some of the many swimming holes around Kununurra and some on the way to Wyndham. We quickly cleaned the house and then we were on our way to the first spot when the sky very rapidly became darker and darker and within minutes it was raining so heavily we could only see a few metres in front of us. 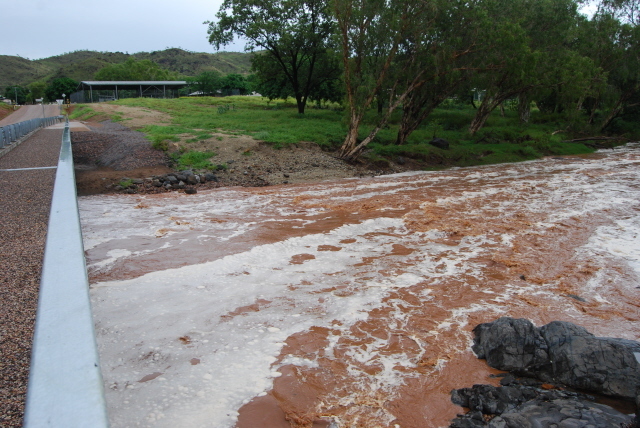 We hadn't even got out of Kununurra! Well it rained and rained and showed no sign of letting up so we headed back to Warmun. There was no way I was going on a dirt track in the rain with 3 ton of groceries on board but at least if we did get bogged we wouldn't have starved. 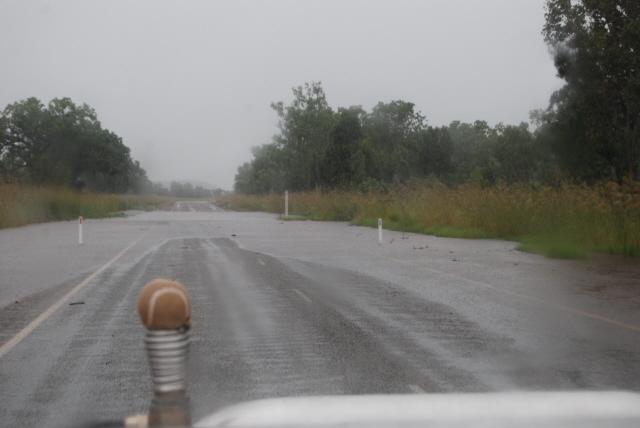 In about six places on the Great Northern Highway there was a significant amount of water over the road. 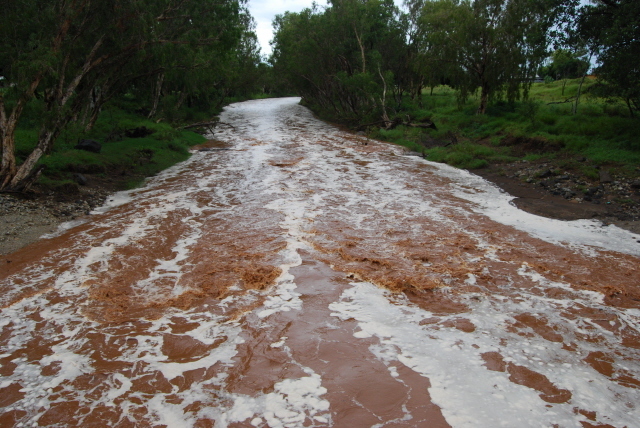 All the rivers and creeks were flowing as was a waterfall that can be seen from the road near Doon Doon Roadhouse. So much for checking out the sights. So our weekend away came to an early end. That did give us time to unpack the car and put all the food away. The pantry looks very healthy. It also gave me time to unpack one of our ebay toys that had just arrived. I must say I am very impressed with this thing. It is a 1tb multimedia player and recorder made by Noontec. It is about the size of an external hard drive but has lots of lights, slots (for all types of camera cards, USB's, another hard drive and more) and a remote control. It stores all your DVD's, photos and anything else you may want and then plugs into your TV via a RCA or HDMI cable. It not only plays things but also can record anything off your TV and even has 'Real Time', which for those like me who had no idea, means you can be watching a TV show, stop it to go to the toilet or discuss the show and then just start it up where you finished off. Bloody amazing, and you can choose your brand of hard drive all for $220.00. Try buying a hard drive recorder for that price. And to make it even better it came from an Australian company. For us the best part is we no longer have to carry any DVD's with us which is great as they are bulky and get scratched, even in those fancy carry cases. We also received our new Dell laptop computer. It was a bit of a painful process this time getting the thing, as they seemed to have lost our order with the computer taking nearly 40 days to be delivered as opposed to the 9-12 days that they quoted us. We mainly wanted the new laptop for the boys internet lessons as our old one is so slow that the lesson is nearly over before it loads up all the info and it kept dropping out. The boys have found it a bit frustrating. This new one has the best of everything including 6 gig of Ram and has made a huge difference. So far I am very impressed with Windows 7. It is very user friendly, and I think will do more than we will ever want it to do. It looks very smick and the HD picture is amazing. We have the old and the new laptops sitting side by side on the table and the difference in the picture has to be seen to be believed. I just hope it is as reliable as the old one. Back to Warmun. The country side around here is some of the most spectacular there is to see. 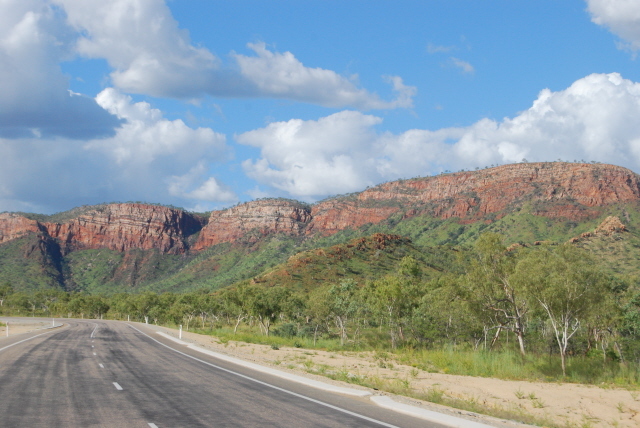 The drive into Kununurra is mountain range after magnificent mountain range, creek after creek. 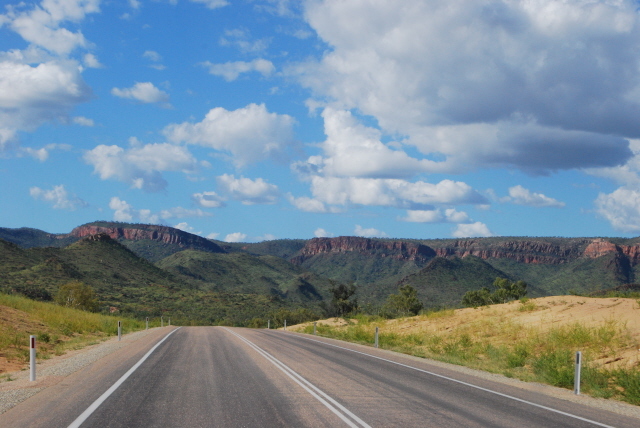 I have done the drive to Doon Doon roadhouse which is half way to Kununurra a number of times now. If we have a patient who is sick enough to be evacuated out of here, we generally do a 1/2 way meet with St. John Ambulance and meet them at Doon Doon where they turn around and head back. As I like the drive, I have done it each time when needed, which has been very pleasant and a nice way to spend a few working hours. Our ambulance is well decked out complete with a full set of flashing beacons and siren. As you could imagine, in the dry season this stretch of the highway is one of the busiest around being the main northern route, east to west. While the road is exceptionally good having just had a few years of upgrades, there is still the occasional accident. Give it another month and it will be an endless procession of grey nomads and their caravans snaking their way across the country. As I said earlier we have done very little but have remained rather busy. The boys school work is going really well and Chris has been picking up the odd relieving day at school as well as her regular 2 hours/ 3 days a week which she enjoys but at the same time finds a bit frustrating. It seems they don't really have much in the way of behaviour management in place and with no consequences, the kids rule the roost. After our boys have finished their school work they usually take off to the basketball courts over the road and have a game of basketball with the local kids. The kids here are actually really nice, polite and play well together. 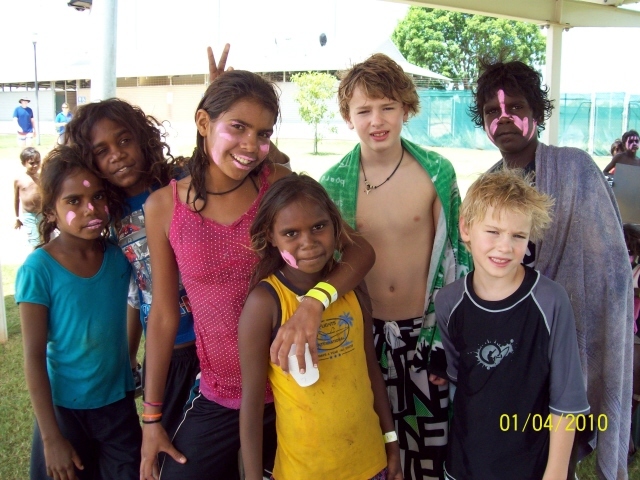 As per usual our boys have blended in and seem very popular with the local kids. Some kid the other day had a go at Harry, but when Alex intervened and politely suggested to this kid that he should leave or else, it was all over. It's water off a duck's back to Harry and Alex has them all bluffed. A few weeks back they had some people out running a program called 'Blue Earth'. 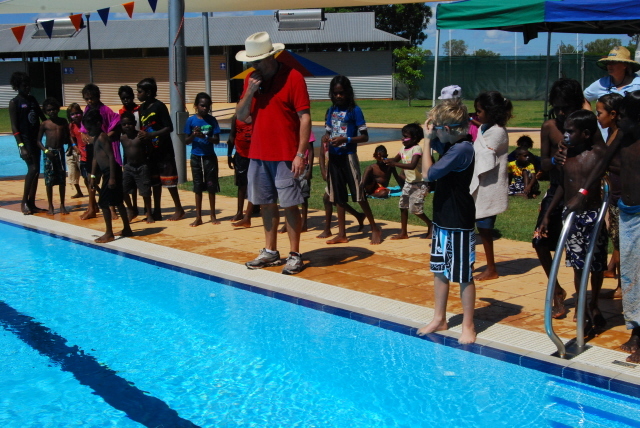 It's one of these self esteem, character building programs like 'Rock and Water'. One of the activities was chinese wrestling. In the game you have a ring marked on the ground and you have to try and push your opponent out of the ring. Alex was there for the lesson and was displaying his strength. He was unrelenting in his pursuit to be the overall winner with the local kids just saying 'He strong, boy he strong'. While he had no problems with the kids before, he certainly won't have any now. 'Dey all scared o' 'im'. Last friday night just on sunset we went up near the art gallery as there was a corroboree on. I am not sure what the reason for it was but we were invited. There were a lot of kids involved with all the oldies who can no longer dance banging their clap sticks and singing and chanting. It was quite an experience as this was not done as a display, but done just for them while allowing us the privilege of being invited. It was colourful, rhythmic and very musical. How many white fellas get opportunities like this?? One part that we found rather funny was 1/2 way through one dance a snake decided to make its way through the middle of the dancers. The dancing stopped, the snake was belted with a stick, thrown into the bushes and the dance continued as if nothing had happened. 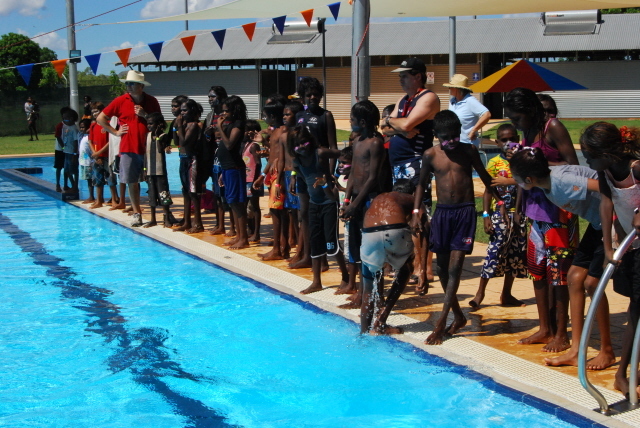 The last day of school for this term had the school and Chris and the boys at the local pool for the school swimming carnival. It seemed that there were more staff there than kids, but everyone had a good day. Harry swam in his age race that he won by 1/2 a pool length and Alex swam in two relays in which he also did well. I ducked out from work to see the epic event but unfortunately missed the big races with the white boys. Our two do look seriously out of place amongst this bunch. Having a pool as flash as this outfit makes such a difference when you are living in the scrub. The last week of March and the tempo increased as we now start the packing for Vietnam. We will be heading off to the Bungle Bungles on Good Friday (the day they officially open the park, weather permitting) and will stay there until Easter Monday. 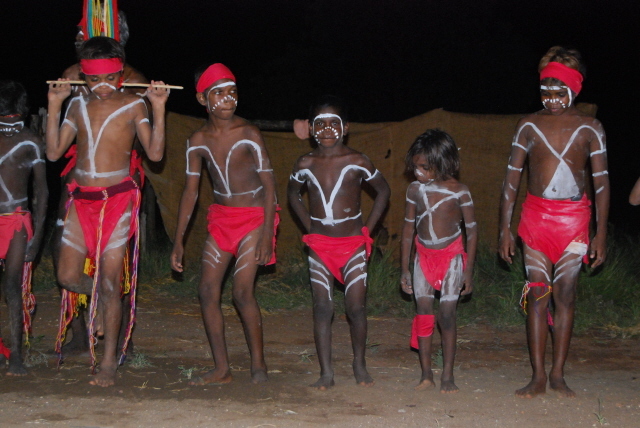 Then we come back to Warmun for the night before heading off the next morning for Darwin. 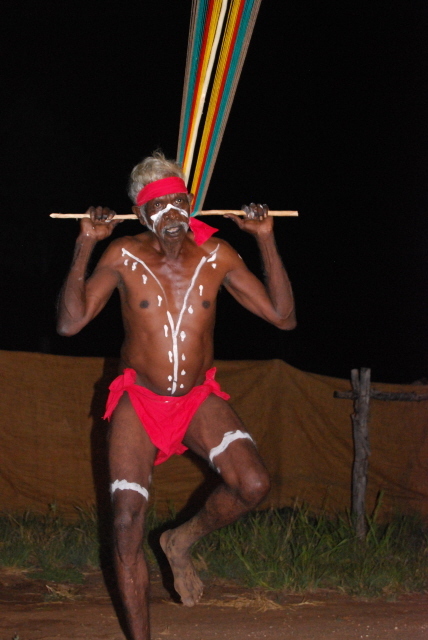 We then have a few days in Darwin and fly to Vietnam for a month on Saturday 10th April. 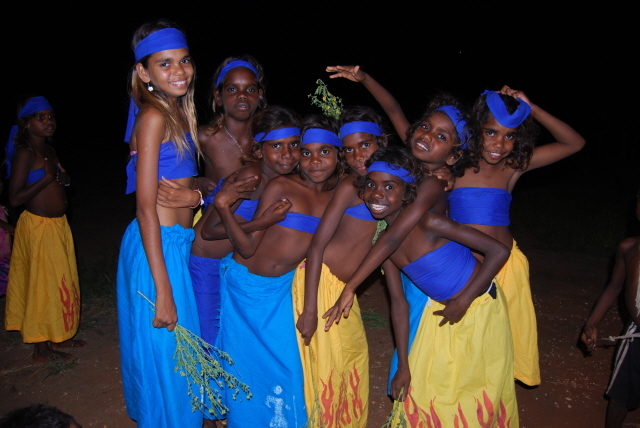 After that we will spend a few days back in Darwin before making our way back to Warmun. That will be a 6 week break. 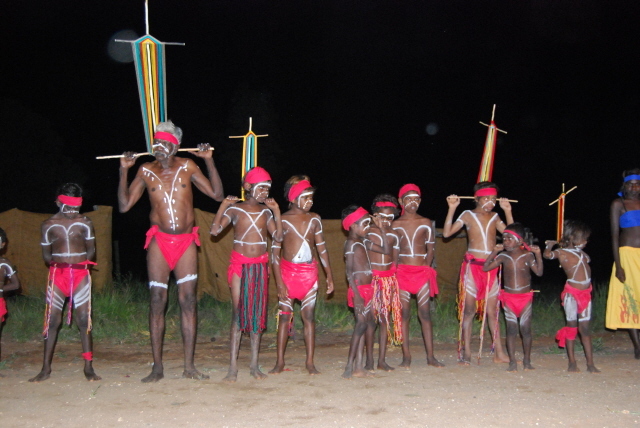 We then come back to Warmun for a month before heading off to Cape York and the Gulf for about 6 - 8 weeks. Not sure what we will be doing after that, possibly back to One Arm Point at Cape Leveque. The April update will a bit later than usual as we don't get back to Warmun until the 17th May, and there will be a lot to write about.